If you even have the remotest interest in Apple Inc or its CEO Steve Jobs, you are in for a treat. For someone who has guarded his private life more than any new Apple product design, it was a surprising move when he allowed for an autobiography on him. 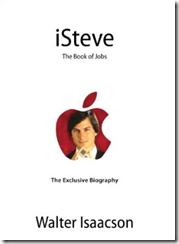 iSteve: The Book of Jobs is now available in Amazon for pre-order for $18.00. The book will be available on March 6, 2012. You can also get the Kindle edition for $14.99.